, we announced PHP as the latest supported runtime for Google App Engine in Limited Preview. PHP is one of the world's most popular programming languages, used by developers to power everything from simple web forms to complex enterprise applications. Now PHP developers can take advantage of the scale, reliability and security features of App Engine. In addition, PHP runs well with other parts of Google Cloud Platform. Let's look at how this works. Many PHP developers start with MySQL when choosing a database to store critical information, and a wide variety of products and frameworks such as WordPress make extensive use of MySQL’s rich feature set. Google Cloud SQL provides a reliable, managed database service that is MySQL 5.5 compatible and works well with App Engine. To set up a Cloud SQL database, sign into Google Cloud Console - create a new project, choose Cloud SQL and create a new instance. After you create the instance, it's automatically associated with your App Engine app. You will notice Cloud SQL instances don’t need an IP address. Instead they can be accessed via a compound identifier made up of their project name and instance name, such as hello-php-gae:my-cloudsql-instance. Methods such as query() work just as you’d expect with any MySQL database. This example uses the popular PDO library, although other libraries such as mysql and mysqli work just as well. Reading and writing files is a common task in many PHP projects, whether you are reading stored application state, or generating formatted output (e.g., writing PDF files). The challenge is to find a storage system that is as scalable and secure as Google App Engine itself. Fortunately, we have exactly this in Google Cloud Storage (GCS). With the PHP runtime, we’ve implemented native support for GCS. 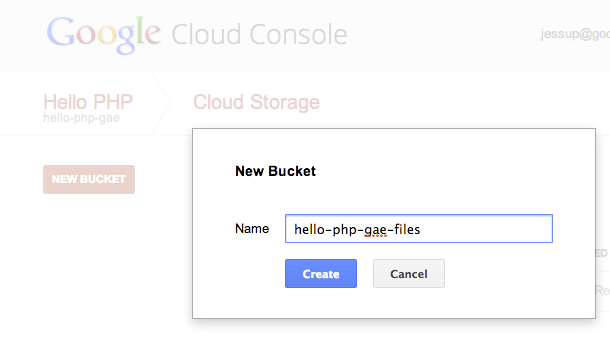 In particular, we’ve made it possible for PHP’s native filesystem functions to read and write to a GCS bucket. The same fopen() and fwrite() commands are used just as if you were writing to a local file. The difference is we’ve specified a Google Cloud Storage URL instead of a local filepath. Many of our most popular App Engine APIs are now supported in PHP, including our zero-configuration Memcache, Task Queues for asynchronous processing, Users API, Mail API and more. The standard features you’d expect from App Engine, including SSL support, Page Speed Service, versioning and traffic splitting are all available as well. Today we’re making App Engine for PHP available in Limited Preview. Read more about the runtime in our online documentation, download an early developer SDK, and sign up to deploy applications at https://cloud.google.com/appengine/php. At Google I/O, we announced PHP as the latest supported runtime for Google App Engine in Limited Preview. PHP is one of the world's most popular programming languages, used by developers to power everything from simple web forms to complex enterprise applications.